When we met our first alpaca back in 1998 we were instantly 'smitten' with these wonderful creatures. It didn't take long to decide that alpacas were to become a part of our lives. Our first order of business was to undertake the building of a barn and by the time our first bred females arrived at our farm in 2003, we were quite confident in our ability to be dutifull caretakers and have since grown our herd to a healthy size of 13 with another arrival on the way. Our farm is still a work in progress, but if you can measure your success by how much you enjoy what you are doing; then, for us, this is the right place to be. 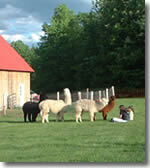 We welcome your visit to our farm and look forward to sharing with you our alpaca experience.